You know that i am really like making any option of Vegan Brownies . I've tried so many recipes and now i really excited with this fruit .. Yupp its Raspberry can you imagine the delicious brownies can be!! Chocolate and all the berries, it’s been real. But it would be wrong of me not to squeeze in just one last choco-berry treat on the actual day. They may not come in a heart shaped box or with a bouquet of roses. And they may require a little effort on your part. But these brownies, they love you. And after that first extra fudgy bite I’m pretty sure the feeling will be mutual. 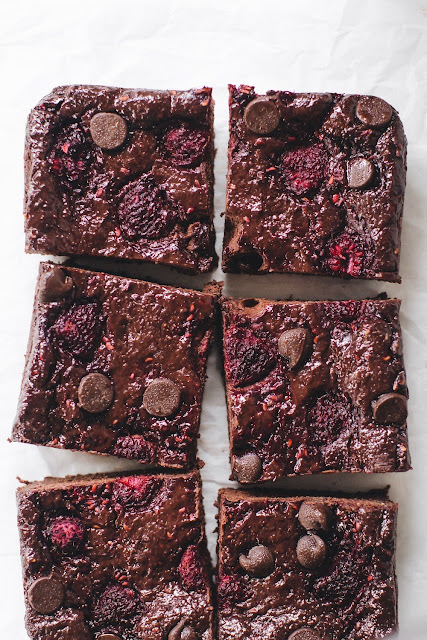 Without a high speed blender these brownies would be a seedy disaster because raspberries = very seedy. So blend the bejeezus out of those berries until not a seed can be found before adding the rest of the ingredients. Fruity and EXTRA fudgy berry-studded brownies. 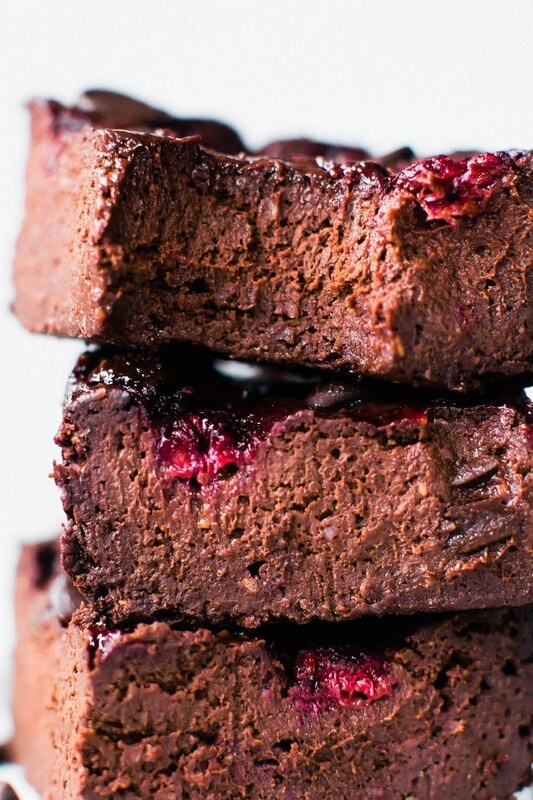 These easy raspberry blender brownies taste like (healthier) chocolate heaven! Vegan, gluten-free, paleo option. Heat the frozen raspberries to room temp or warmer (or you can use fresh). I microwave them for about 2 minutes on high. Blend on high until very smooth with no seeds remaining. If you have a smaller blender container, that works best here. Add the melted chocolate along with the rest of the ingredients to the raspberry puree. Blend until combined to form a thick batter (it will be thinner if you are using almond flour). Stir in the 1/2 cup whole frozen raspberries. Transfer the batter to a baking dish lined with parchment paper. Spread evenly and top with additional raspberries and chocolate chips.